Steve Grossman brings to the office of Treasurer a family heritage of public service, a lifetime dedicated to helping others, and years of experience as a hard-working businessman with a sense of responsibility for the well-being of his colleagues and his community. He is committed to using the full potential of the Treasurer’s office to protect the public’s money, help create jobs, boost small businesses, and bring new standards of transparency and disclosure to state government. Throughout his career, Grossman has had an unshakable commitment to recruiting and hiring the most qualified people to help him develop the most effective and cost-efficient ways of doing business. These principles have guided his administration as Treasurer. By delivering on his promise to put all Treasury contracts out to competitive bid, Grossman has saved taxpayers over $11 million in reduced service fees and administrative costs. He has established the Small Business Banking Partnership, which has deposited over $300 million of Treasury cash reserve funds in community banks to help grow Massachusetts small businesses and promote job creation. And by reforming management practices and utilizing innovative marketing approaches, Grossman oversaw a record-breaking fiscal year in 2012, with the Massachusetts State Lottery earning an unprecedented $981 million in net profit for taxpayers and the Unclaimed Property Division returning over $93 million worth of cash, stock and mutual funds to their rightful owners. Prior to being elected Treasurer in 2010, Grossman spent 35 years creating jobs, managing money, dealing with crises, and finding commonsense solutions to problems as CEO of Grossman Marketing Group in Somerville, a 102-year-old, fourth-generation family business. He also served as chairman of both the Massachusetts and national Democratic parties, where he established a track record as a reformer and builder, worked aggressively to implement effective management and financial controls, and empowered more activists to participate in political life. Grossman chairs the Advisory Board of Cambridge College and serves as an advisory board member of the Women’s Lunch Place. He was a founding board member of Massachusetts Institute for a NewCommonwealth (MassINC), a former campaign chair of Combined Jewish Philanthropies, and a founding board member of the Lenny Zakim Fund. 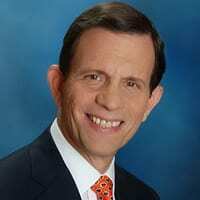 Treasurer Grossman is a graduate of Princeton University and Harvard Business School. His wife, Dr. Barbara Wallace Grossman, a theater historian, author, and director, is a professor at TuftsUniversity and serves as Vice Chair of the Massachusetts Cultural Council. They have three sons, David, Ben, and Josh.